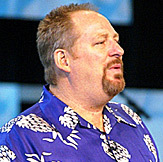 TWO’s Mike Airhart revealed that Thompson, along with ex-gay activist Tim Wilkins were also invited to the 2006 Global Summit on AIDS and the Church – which was hosted by Warren. Far from a pragmatist, Warren is Jerry Falwell in a Hawaiian shirt. But, at least he feeds doughnuts to protesters who are upset that he has taken away their equal rights.